I must say, I was quite surprised at all the correct answers for our last photo. 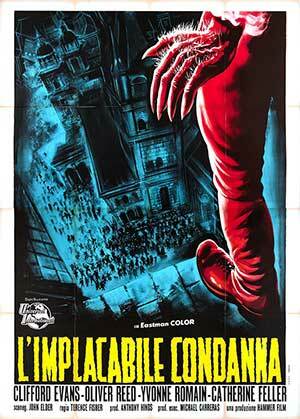 The shot was from the Italian film Night Train Murders, which is also known under a few other names. But we got a lot of correct answers, which really means that you people are a bunch of degenerates! And we welcome to the club with open arms!!! So a big kudos goes out to the following: Hoby Abernathy, Derek Botelho, Aaron Christensen, Jerry Downing, Doug Lamoreux, Kevin Matthews, Dustin Moravick, Vanessa Nocera, Gavin Schmitt, Wayne Teeter, Tom White, William Wilson, and Greg Wojick. Well done! Now for this photo, it might be pretty easy, but as you can see, it is done in tribute for obvious reasons. But can you name the film? Just send us an email at jon@kitleyskrypt.com if you can name the correct title. Good luck. 26 Tracks with a total running time of 52 min. 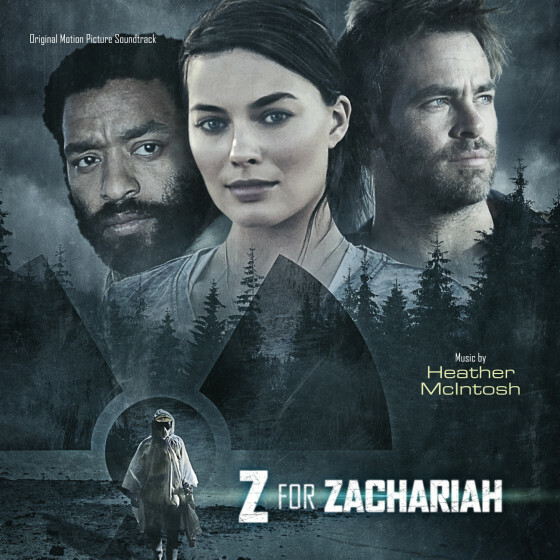 This is another great example where we get a score to review, have no idea what the movie is about, but really enjoy the images it creates in our minds eye. Or really, the feelings that the music creates. For this one, it brings to mind a feeling of peacefulness and somber. Sure, for a horror site, one would think this wouldn’t be something we would like. Well, it might not be one we would always listen to, but any score that can create a mood or feeling, just by the music, means that the creator has done something magical. Published by Silman-James Press, 2003. 296 pages. Author Boulenger has spent four years interviewing Carpenter about himself and his movies. 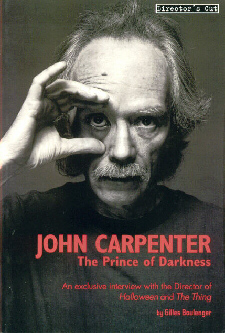 This title reads like one long and intricate interview, covering all of Carpenter’s work up to Ghost of Mars. This is a very interesting read here folks, giving us a ton of insight to this man, as well as his filmography. From a director that has given us some incredible films in his career, many that still hold up today, you get to hear how some of them came about, and also about some of the problems that came with it. I think my only complaint about this book is that there are several occasions when a project that Carpenter had worked on, either as scriptwriter or doctor, but it’s mentioned in passing and we don’t get to hear any detail about it. I was amazed to hear how many projects that Carpenter was connected to at one time or another. But this is a minor complaint. But in any case, this book is well worth the price, and really can give young filmmakers some depressing stories of what they might have to deal with. There is a great story Carpenter tells about a director and producer stranded in the desert that is hilarious. Obviously if you are a Carpenter fan, then this title is a must for your collection. If not, it is still one great read. Quite the surprise to see so many correct answers for last week’s Mystery Photo. Sure, it wasn’t that obscure, but glad that quite a few of you were familiar with Christopher Smith’s debut film, Creep. I’ve really enjoyed everything he’s done so far and am always looking foward to his next project. So a big kudos out to the following: Hoby Abernathy, Jason Buchanan, David Greenwood, Kevin Matthews, Freddy Morris, Gregg Olheiser, Gavin Schmitt, Wayne Teeter, AJ Wagar, and William Wilson. Good on you! Well, this week’s photo is going to be a bit more nasty and tasteless. This is from a very dark and would not be one that I would recommend for a Sunday afternoon family fun viewing either. But take a look and see if you can identify it. Good luck. And please remember, do not post your answer in the response section below, but send me an email at jon@kitleyskrypt.com. Come and Celebrate the Drive-In! Sure, this might not be the first time I’ve waved this flag, but there are a couple of events coming up that I wanted to bring to everyone’s attention. As I’ve posted before, next weekend the Kitley crew will be heading down just south of Indianapolis, to the Skyline Drive-in in Shelbyville. The are holding their annual 3-night all night monster movie marathon. We won’t be leaving until late on Friday but am still hoping to catch the last 3 titles scheduled. Then we will be staying over night and catching all 5 titles on Saturday night. Having the opportunity to see films like Tarantula, Horror Express, Island of Lost Souls, not to mention the original King Kong, really is like dream come true for a movie nut like me. But the drive-in is so much more than just the movies. 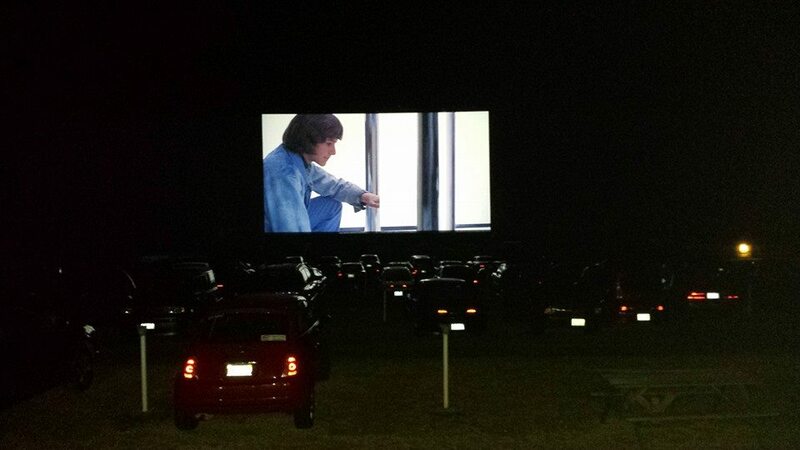 Yes, it is a great time, but it is also that step back into time, when going to the drive-in really was an experience and one that is remembered for years to come. You can get all the information about this even HERE. Our last photo didn’t get the same response as the one before, which is a surprise really due to the director was John Carpenter. That’s right, the shot was taken from the film he did right before Halloween, a made-for-TV movie called Someone’s Watching Me! Congrats go out to Cate Cameron and William Wilson for sending in the correct answer. I know I’ve forgotten to name a few people that have sent in the correct answer, so I do apologize. But the best way for me not to forget your guess is to send it to me in an email. That gives saved, so there’s little chance of me losing it. Anyway, let’s get to this week’s photo. Might be a little tougher, but those are good every now and then, right? So here you go…take a peek and let me know what you think. And if you think you know it, just send us an email to jon@kitleyskrypt.com. Good luck. We had recently received our copy of the first volume of Peveril Publishing’s book series, The Fantastic Films of the Decades and was just blown away by it. The layout is fantastic and am amazed at how much stuff they covered for a decade of silent films. Of course, this is just the first of nine volumes, so there is much more greatness to come, not to mention the chuck out of my bank account this is going to take. But if the rest of the editions are as good as this first one, it will be a well worth investment.